by John W McWilliam Coat of Arms no 185, Spring 1999. King James VI of Scotland succeeded to the throne following the abdication of his mother, Mary, Queen of Scots, in the late July of 1567, then, while still only thirteen months old, was crowned at Stirling just three days later. On 13 March 1603, Elizabeth, Queen of England died and, touching on who should follow her as sovereign is reputed to have said “I will that a king succeed me, and who but my kinsman the king of Scots”. 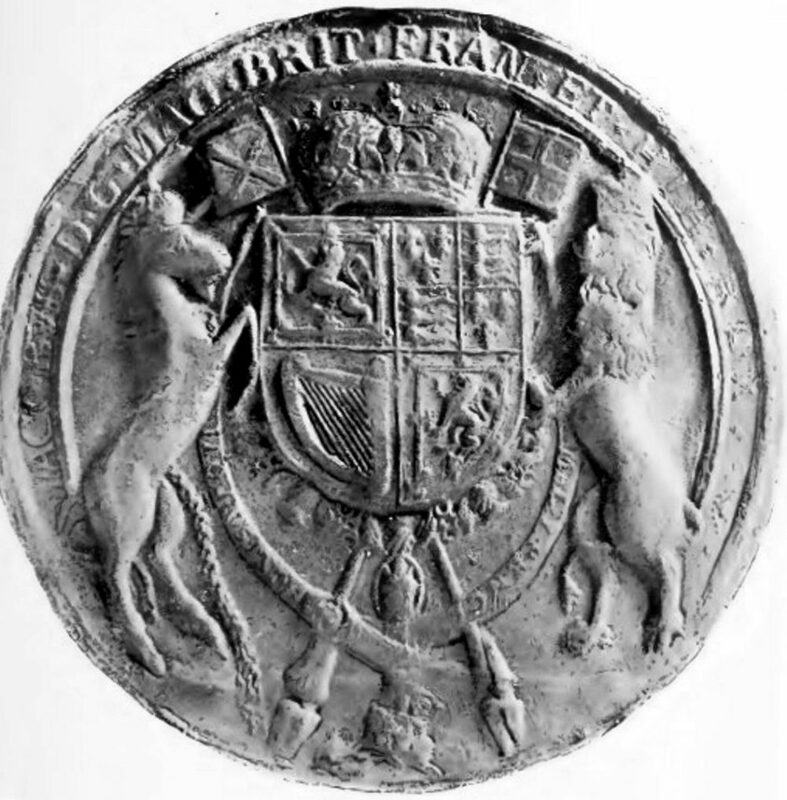 A few hours after her death, in accordance with arrangements made by the Privy Council, James was deemed to have entered into his heritage and thus became the first of his name to rule the southern kingdom. That night bonfires were lit in the streets of London and Sir Robert Carey rode with all speed to Edinburgh with the news. It has been said with some authority1 that royal arms as “Ensigns of Public Authority” are governed by their own special rules. 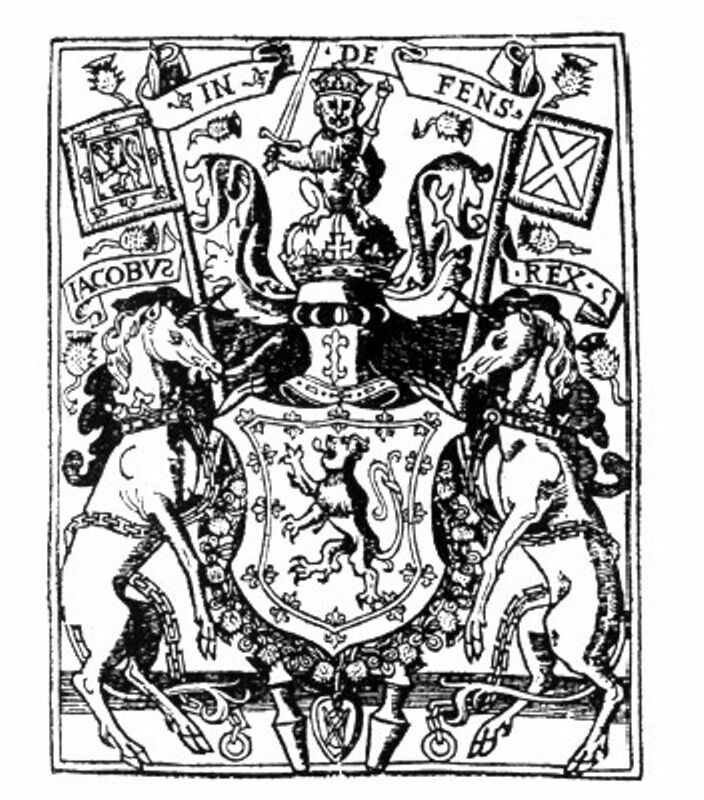 They are not hereditary, but pass by “ succession, election or conquest”: and this has been so in the case of the Royal Arms of Scotland throughout history, and likewise the Royal Arms of Great Britain as used in Scotland after 1603. The design has not always been the same, however. Around 1244 Matthew Paris depicted the shield surrounded by a bordure with ten fleur-de-lis all pointing inwards, and it was not until the reign of Alexander III (1249-1286) that the border had become the now familiar double tressure flory counter flory. Even then there was a change, for in February 1471 an Act of Parliament stated that “the King, [James III] with the advice of the three Estates ordained that in time to come there should be no double tressure about his arms, but that he should bear whole arms of the lyoun without any more”. This curious state of affairs, possibly brought about to give the lie to any suggestion that Scotland was a French fief as a result of the king’s aunt Margaret having married the future Louis XI, did not last long, and for a short period the double tressure was re-introduced without a top,3 before being fully re-instated. The Royal Arms as officially used in Scotland. The sovereignty of James VI and I over his two realms created a new situation necessitating consideration of the design of the Royal arms. As is often the case where circumstances conflict, an elegant compromise was reached, it being decided to have somewhat different arms for the two countries. The shield is surrounded by a collar consisting of thistle heads and knots, Scotland. There is no known evidence to regard this as being the Order of the Thistle. Some authorities believe it may represent an Order of Scotland later renamed the Most Ancient and Most Noble Order of the Thistle by King James VII and II in 1687. Other authorities assert the “revival” or re-naming was, in fact, the foundation of the Order, the insignia being based on collars, possibly of a personal nature, worn by a number of earlier monarchs. For use in England the first and fourth grand quarters carried the three lions passant guardant as assumed by King Richard I (1189-1199) quartered with the three fleur-de-lis of France marking the ancient claim to that country. The second quarter was occupied by the rampant red lion of Scotland while the third depicted the harp of Ireland, regularly incorporated for the first time. For use in Scotland the rampant lion within the double tressure was granted the first and fourth quarters, England quartering France the second, and Ireland, as before, the third. 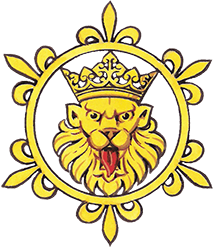 The crest on the Scottish version of the achievement was On an Imperial crown proper, a lion sejant affrontée gules, imperially crowned or, holding in the dexter paw a sword and in the sinister paw a sceptre erect and proper. For England the crest remained On an Imperial crown proper, a lion statant guardant or, imperially crowned proper, while the supporters became an English lion, crowned, on the dexter, and a Scottish unicorn on the sinister. 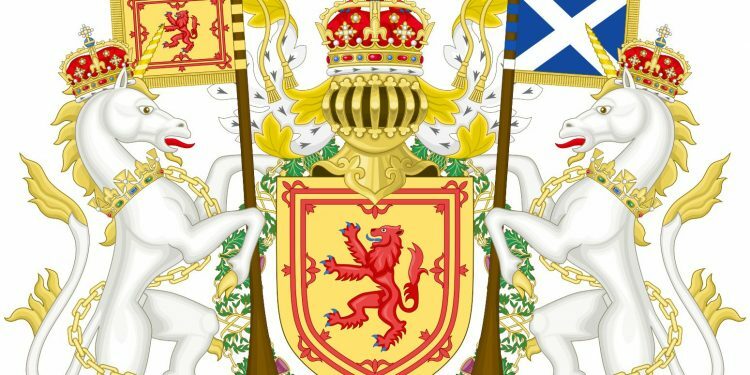 For the northern realm the Scottish unicorn was placed to the dexter, imperially crowned and holding a tilting lance flying the cross of St Andrew, while on the inferior side the English lion similarly crowned supported a tilting lance flying the Cross of St George. The shield is surrounded by a collar of thistle heads and the Collar of the Order of the Garter, indicating that James became sovereign of the Order on succeeding to the English throne. The lion supporter is not yet guardant. top, for his Majesties Crest, of a Lyon sejant full faced gules crowned or, erected. Supported on the dexter be ane Unicorne argent crowned with ane Imperiall and Goarged with ane open Crowne to this a chaine affixed passing betwixt his fore-leggs and reflexed over his back or, and on the Sinister, the other. The first embraceing and bearing up a Banner azur charged with St. Andrews cross argent, and the last ane other Banner argent charged with a cross (called of St. George) gules: both standing on ane rich compartment placed underneath from the middle whereof issue a thistle and rose as the two Royall badges of Scotland and England. 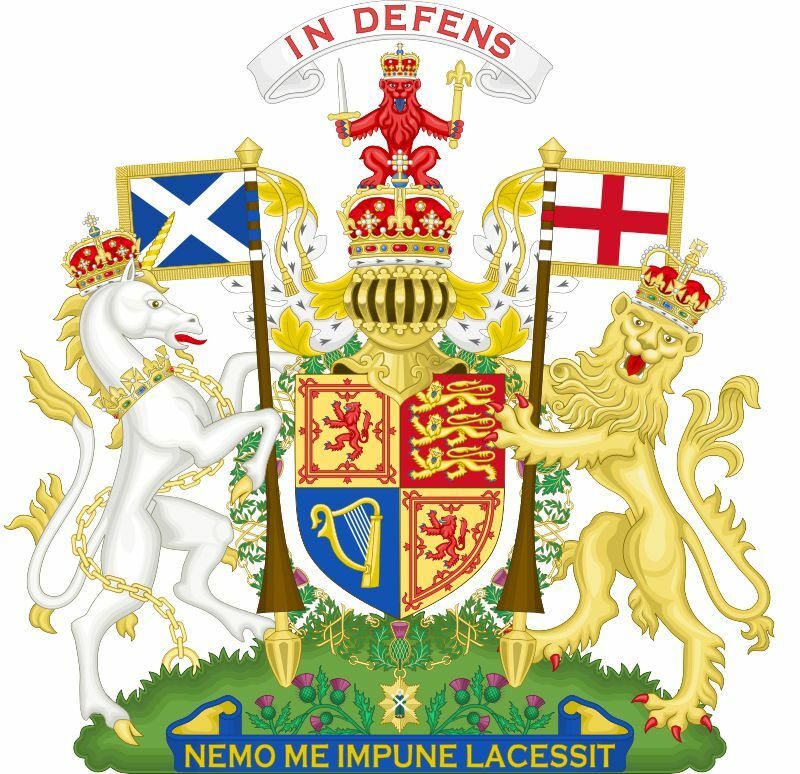 And for his Majesties Royall motto’s In ane escroll above all In defence for Scotland and in the Table of the compartment Dieu et mon droit, for England, France and Ireland. In 1707 the Treaty of Union established the Royal Arms under Chap XXIV of the Act and the foregoing was in every essential particular confirmed. Today, when all pretensions to the throne of France have long been consigned to history the Royal Arms of Great Britain as officially used in Scotland are simple, logical and attractive as shown below. The Royal Arms as used in England are equally so. The author is grateful to Lyon Clerk and Keeper of the Records for a copy of the text extracted furth of the Public Register of All Arms and Bearings. 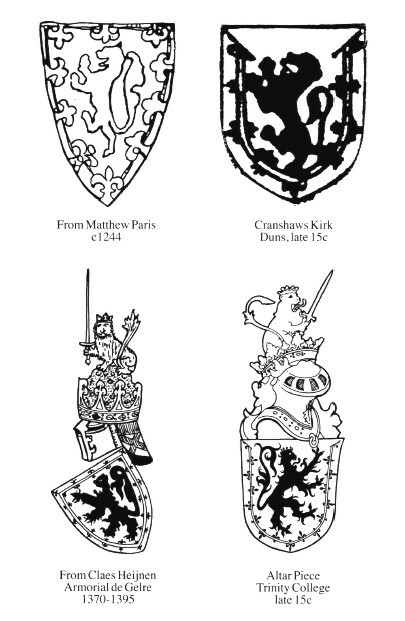 Sir Thomas Innes of Learney, Scots Heraldry (1956 edition) p211. Charles J Burnett “The Development of the Royal Arms to 1603” The Double Tressure (1977/78) pl0.